The ashes of a British man who died after crashing in an off-road rally in Texas are being brought home by his parents ahead of a memorial service. A police officer leading an investigation into the crash said he was "not a fan" of the event. Lynne Fairbairn said she was searching for answers about her son's death. 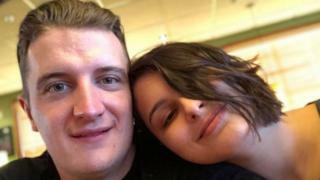 A funeral for Mr Fairbairn, who proposed to his American fiancée Abbey Green two weeks before his death, was held on 23 March in Duncan, Oklahoma, where he moved 18 months ago. He travelled to the four-day annual rally near Fort Worth with a friend who was in the vehicle that crashed, but escaped serious injury. Mr Fairbairn's death was ruled accidental by a local medical examiner. Chief Deputy Jack Lawson, of Montague County Sheriff's Office, said: "The event was held on private land and has its own safety officers and security, so we can only do so much. "No crime appears to have been committed, but we are looking into whether there was any negligence or intoxication." He added: "There are about 10,000 people there, but my department only has five deputies, there's no way we could effectively police it." Mr Lawson said three other people had died at the annual event since 2015, including a 10-year-old boy. Mrs Fairbairn said she had questions about how the rally was run and how her son had died. She said: "We need to know exactly what happened. We need someone to tell us. "We've been trying to piece together some of Steven's life here in Oklahoma and visiting his favourite places with Abbey. The American people have been just fabulous. "We've had to wait on his ashes being released from the funeral directors and the necessary paperwork to travel back home. "There will be a further service to celebrate the life of Steven once we're home." The rally operators have been approached for comment.